Mt. Kailas, the holy mountain of the Hindus, Buddhists and Bons (the old religion of Tibet), is situated in a fairly remote part of Western Tibet, near the Indian border. It is a natural pyramid, standing alone and perpetually capped with snow. For Hindus it is the primal abode of Lord Shiva who sits in eternal meditation on its peak. The basic architecture of Hindu temples is based upon its shape. The Buddhists associate it with their tantric deity Chakrasamvara and the Bons believe it is the giant crystal that their founder Thonpa Shenrab descended on from the heavens. At its base are two lakes—Manasarovar and Rakshas Tal representing positive and negative energies. The site is quite remote and for most it is an arduous journey in itself to reach. Many pilgrims make a parikrama (circumambulation) of Mt. Kailas that usually takes from three to four days, although some take longer because they prostrate themselves at every step. 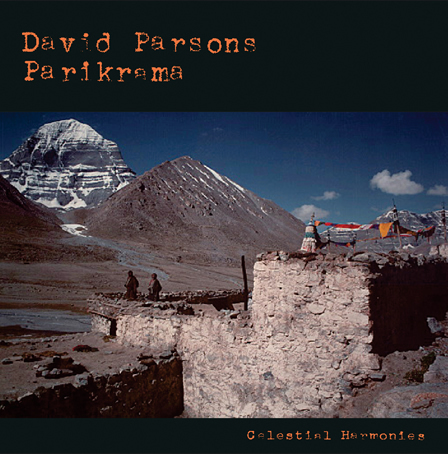 With this project, David Parsons attempts to create a sonic "parikrama" of Kailas and the surrounding area. Most tracks are intentionally quite long in order to give the feeling of an odyssey, in hopes that the listener will experience, more than just listen to, the soundscapes. From his homeland in New Zealand, David Parsons travels frequently to Asia for spiritual and musical inspiration. After collecting musical samples and studying different musical and cultural traditions, Parsons returns to his studio to integrate these influences with his own experiences. In the process, he bridges disparate elements with seamless grace, and creates a unique musical affirmation of our common humanity and cultural endowment. Parsons has been a student of Indian music, studying with Dr. Krishna ChakravartyAnanda (17046), Dancing to the Flute (13135), and Circular Dance (13133). To Parsons' credit as a musician, composer and performer, he has evolved into a rare and highly acclaimed producer of cultural music traditions. His work is often featured in film, television and radio scores, and continues to be widely praised by reviewers.